As long as employment growth keeps pace with labour force growth, unemployment will not rise. If you didn’t get this correct then it is likely you lack an understanding of the labour force framework which is used by all national statistical offices. The labour force framework is the foundation for cross-country comparisons of labour market data. The framework is made operational through the International Labour Organization (ILO) and its International Conference of Labour Statisticians (ICLS). These conferences and expert meetings develop the guidelines or norms for implementing the labour force framework and generating the national labour force data. Similarly persons who undertake unpaid voluntary work are not in the labour force, even though their activities may be similar to those undertaken by the employed. The category of ‘permanently unable to work’ as used in Australia also means a classification as not in the labour force even though there is evidence to suggest that increasing ‘disability’ rates in some countries merely reflect an attempt to disguise the unemployment problem. The following diagram shows a partial view of the Labour Force framework used by the statisticians in this context. The Working Age Population (WAP) is usually defined as those persons aged between 15 and 65 years of age or increasing those persons above 15 years of age (recognising that official retirement ages are now being abandoned in many countries). 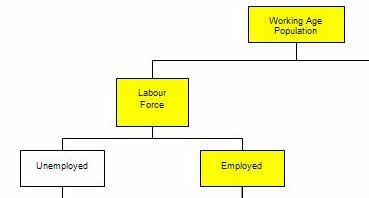 As you can see from the diagram the WAP is then split into two categories: (a) the Labour Force (LF) and; (b) Not in the Labour Force – and this division is based on activity tests (being in paid employed or actively seeking and being willing to work). The Labour Force Participation Rate is the percentage of the WAP that are active. You can also see that the Labour Force is divided into employment and unemployment. Most nations use the standard demarcation rule that if you have worked for one or more hours a week during the survey week you are classified as being employed. If you are not working and indicate either you are not actively seeking work or are not willing to work currently then you are considered to be Not in the Labour Force. Consider the following Table which shows the Labour Force aggregates for a stylised nation and the WAP, Labour Force and Employment are all growing at a constant rate (in this case 2 per cent). You observe unemployment rising although the unemployment rate is constant as is the participation rate. The reason is that the Labour Force is a larger aggregate than Employment because it would be impossible for unemployment to be zero (frictions alone – people moving between jobs – will deliver some small positive unemployment). So although both the Labour Force and Employment grow at a constant rate, the gap between them (Unemployment) gets larger each period although the proportion of the Labour Force that is unemployed remains constant. Modern Monetary Theory shows that governments do not have to issue debt to match their deficit spending. However, by issuing debt, the wealth of the non-government sector immediately increases, which would not happen if the central bank just credited bank accounts on behalf of the treasury without the debt matching. So within a fiat monetary system we need to understand the banking operations that occur when governments spend and issue debt. That understanding allows us to appreciate what would happen if a sovereign, currency-issuing government (with a flexible exchange rate) ran a fiscal deficit without issuing debt? Further, the target of the fiscal initiative enjoys increased assets (bank deposit) and net worth (a liability/equity entry on their balance sheet). Taxation does the opposite and so a deficit (spending greater than taxation) means that reserves increase and private net worth increases. This means that there are likely to be excess reserves in the “cash system” which then raises issues for the central bank about its liquidity management. But at this stage, M1 (deposits in the non-government sector) rise as a result of the deficit without a corresponding increase in liabilities. 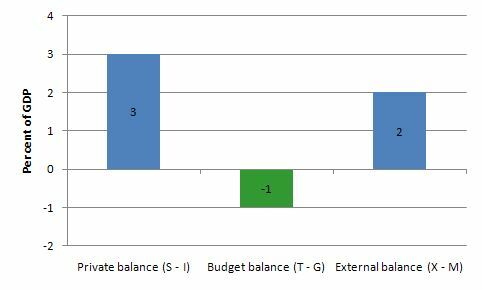 In other words, fiscal deficits increase net financial assets in the non-government sector. The only difference between the Treasury “borrowing from the central bank” and issuing debt to the private sector is that the central bank has to use different operations to pursue its policy interest rate target. If debt is not issued to match the deficit then it has to either pay interest on excess reserves (which most central banks are doing now anyway) or let the target rate fall to zero (the Japan solution). There is no difference to the impact of the deficits on immediate net worth in the non-government sector. (a) Be running a surplus equal to 1 per cent of GDP. (b) Be running a surplus equal to 5 per cent of GDP. (c) Be running a deficit equal to 1 per cent of GDP. (d) Be running a deficit equal to 1 per cent of GDP. The answer is Option C: Be running a deficit equal to 1 per cent of GDP. The first hurdle is to interpret the state of the external sector correctly. The wording “current account balance is running at 2 per cent of GDP” clearly refers to a positive state – that is, an external surplus. Then the question tests your knowledge of the sectoral balances that are derived from the National Accounts. Thus, when an external deficit (CAD < 0) and public surplus (G – T < 0) coincide, there must be a private deficit. While private spending can persist for a time under these conditions using the net savings of the external sector, the private sector becomes increasingly indebted in the process. The outcome is depicted in the following graph (which just assumes that X – M = CAD, that is, the net income transfers are abstracted from). RE Question 3: I was wondering if it is possible to have a situation where you would experience a triple deficit. A random made up example, If the current account balance was -6% of GDP and the Government sector was running a deficit of 5% would it be correct to say that your private sector is running a deficit of 1%? Is that a situation that is possible? Has this actually happened before? Your example merely means that the RoW is running a 6% surplus against the domestic economy so it of course is possible to happen. What could not happen is to have the government, the private sector and the rest of the world be in surplus or deficit all at the same time.